Be the first to share your favorite memory, photo or story of Belva. This memorial page is dedicated for family, friends and future generations to celebrate the life of their loved one. 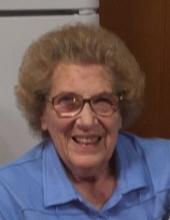 Belva Jane Stone, 87, of Horsepasture, VA passed away Tuesday, October 16, 2018 at Carilion Roanoke Memorial Hospital. She was born May 20, 1931 in Martinsville, VA to the late Eben Stone and Sallie Bowles Stone. In addition to her parents, she was preceded in death by one sister, Eunice Stone Rogers; three brothers, Clifton Stone, Howard Stone, and Russel Stone; and a special niece, Deloris Stone Duffy. She is survived by her devoted sister-in-law, Elizabeth Stone (Clifton) of Horsepasture; two nieces, Jane Rogers Raines and husband, Dean of Culpepper and Sandy Stone (Sue); three nephews, E.C. Stone and wife, Lynn of Horsepasture, Mark Rogers and wife, Janet of Williamsburg, and Russell Stone of Horsepasture. Also surviving are special great-nephews, Josh and Matt Duffy; special great nieces Morgan Stone and Taylor Iacobucci; and her special caregiver and friend, Gwynn McVickers. Belva adored her three great-great nephews, Jake Duffy, Caleb Duffy, and Eli Duffy. She was an avid sports fan and attended all Martinsville Mustang, Phillies, and Astros games. She looked forward to watching her nephews (E.C., Josh, and Matt) play high school and college baseball. Her favorite baseball team was the Boston Red Sox. She went to be with the Lord on Tuesday night listening to the American League Championship Series game between the Boston Red Sox and the Houston Astros. She was well aware that the Red Sox won the game! Belva was also an avid bowler, winning many trophies and traveling to many states with her friends to compete. Belva also enjoyed playing Rook and card games with her family, friends, and anyone who wanted to play. Belva worked at DuPont for thirty-five years before she retired in 1985 to take care of her mother. She enjoyed cooking her favorite dishes on Sunday for her family and sharing her delicious food with friends and shut-ins. Her most enjoyed dish was her famous chicken casserole. A funeral service will be held at 2 p.m. on Saturday, October 20, 2018 at Norris Funeral Services, Martinsville Chapel with Dean Raines officiating. Visitation will be one hour prior to the service from 1 p.m. to 2 p.m. at Norris Funeral Services. Burial will follow at Roselawn Burial Park. To send flowers or a remembrance gift to the family of Belva Jane Stone, please visit our Tribute Store. "Email Address" would like to share the life celebration of Belva Jane Stone. Click on the "link" to go to share a favorite memory or leave a condolence message for the family.